I saw this sign outside an Ace hardware store. Why is "tree" singular but "shrubs" is plural? And it's "1-year," with a hyphen, not "1 year." But forget that, what the heck does the slash between tree and shrubs even mean? Does it mean "Tree divided by shrubs"? Does it mean, God forbid, "Tree and/or shrubs"? Is it possible the signwriter is unaware of the word and? Apparently not, as we see from the reference to the firm of Receipt & Dead. Anyway, sheesh, what hicks. Anyone with any larnin' knows there's no U in "garntee." Slashes are mostly evil, so avoid them. Say what you mean. If you mean "and," say "and." If you mean "or," say "or." Here's a riotous example from an e-mail I received. We are planning a . . . fundraiser for either July 12/July 26. We would be selling hotdogs/hamburgers, chips and water/soda for the volunteers who arrive those days. either July 12 or July 26. Sheesh. We know from the word "either" that she had to mean the slash to stand for the simple, ordinary word "or," so why wouldn't she say that? The first slash might mean hotdogs [sic] AND hamburgers or it might mean hot dogs OR hamburgers. Then we get to chips, which we know for sure "would be sold for [sic] volunteers", but then we get to water, which we know will or won't be sold, along with soda, which we know will or won't be sold. If this were a joke it would be pretty good, but it's not. Anytime you find yourself typing the slash key, stop and delete it and make sure that's the best you can do before you re-type it. And anytime you find yourself about to speak the word slash as punctuation, slap yourself in the face first. Here's another example of confusing "and" and "or." 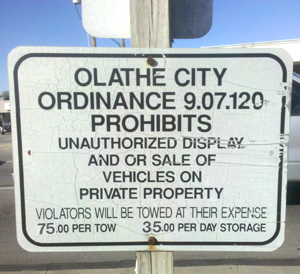 This sign, dispensing with the slash altogether, prohibits the "display and or sale of vehicles." If you prohibit the display of vehicles then obviously you prohibit both the display and the sale of such vehicles. And if you prohibit the sale of vehicles then obviously you prohibit both the sale and the display of such vehicles. The word "and" in this sign simply doesn't mean anything, and whoever wrote it should not be in unsupervised charge of writing any more signs. Furthermore, the cited ordinance does not prohibit the display or sale of vehicles on private property, it prohibits merely PARKING a vehicle on ANY property without the authority to do so. So, this sign, while accurate, relies heavily on the meaning of the word "unauthorized." Also, you can see the bottom of the sign above this one, on the other side of the post, at fptrespass.htm. 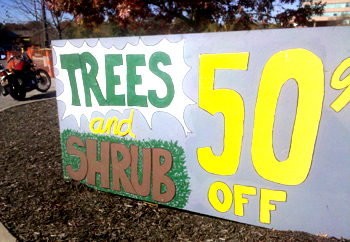 Update of October 31, 2011: I found this sign outside a Home Depot store. As you can see, they got trees right but they got shrubs wrong. Another way to check the fill of an entire puzzle-- without first clueing all (/any) the entries -- is this procedure: Update of December 9, 2018: The sentence at left is unedited. It's from a forum I belong to called Cruciverb-L, and the message is from a crossword constructor to the other members. While I'm sure his advice for "checking the fill" of a crossword puzzle is good advice and all, I record this message because it's the first time I've seen the phrase "all (/any)," and I'll bet it's the first time you've seen it too. I assume what is meant is the ordinary and unconfusable phrase "any and all" or perhaps "any or all," but the point is that I'm not sure.